My leave started yesterday and so far, I'd done nothing much nor gone nowhere far. I did however had a get together with the few of my favourite people on Earth yesterday. 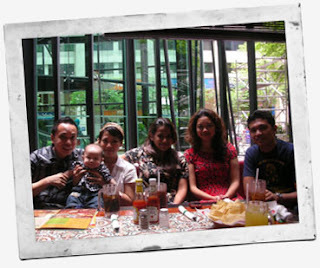 Just a typical gathering I suppose.. Just me, Encem, Bestie, Mumu, Mamita and Baby Ezra! heehee.. I'm pretty sure that if you'd seen us in Midvalley yesterday, it would have seem a bit odd. Five young adults pushing a baby stroller. I don't know, it just felt weird. It still feels like when we were back during training days, but the fact is that Mami is now a mother of a 5-month old baby, Mumu is married and I am in a relationship with Encem. hahahahahha! Just 17 days away to mark the third year we've been with the company. It doesn't feel that long. I still remember how we used to have the mamak-session right after training, until 8 pm everyday. Mami was sort-of single.. hahahha! Mumu hadn't met her spouse yet..
Encem and I were just friends. And Bestie.. well, Bestie tags himself as "forever-alone". It's fun when the four of us who are still flying gets the same day off. So far we'd always do something together on that day. And next month's roster is kind enough to let us have two off days together. It's not consecutively unfortunately, but I'll take what ever that I can get! We're planning on a potluck at Mami's place and I'm pretty certain that we're all excited about it!